This is my second post as a guest designer for Concord & 9th and today I am featuring the super cute Birdie Banners and Banner Alpha Bits (linked below). I needed a little gift for someone who just found out that, after 2 girls, she's having a boy, and she's pretty excited. 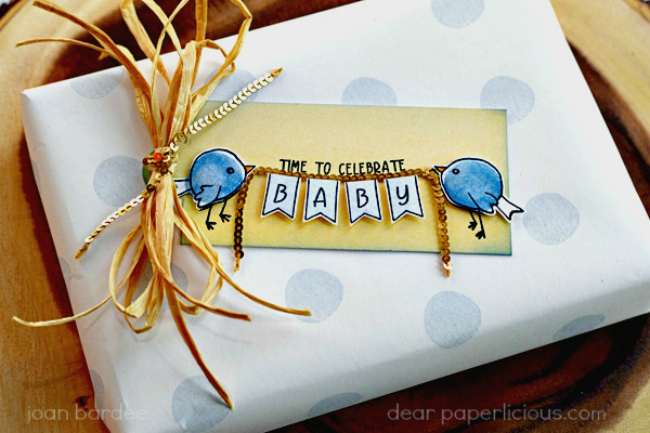 To coordinate the wrapping paper and tag, I stamped white wrapping paper and decorated a tag using Birdie Banners and Banner Alpha Bits, using the wonky circle that comes with Birdie Banners to fill in the body of the birds and to make the polka dots on the wrapping paper. Added some shine to the birds and the banner with Wink of Stella Silver Brush. Used Concord & 9th's Bags & Tags Dies to make the tag. I love that set of dies! And the fun Gold Sequin Strand is also from Concord & 9th. MOOD WHEN DONE = Babies are so cute! okay, this is just tooooo sweet! 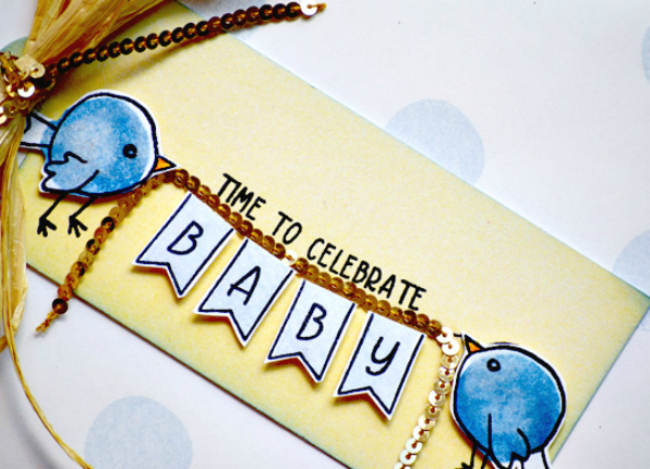 GORGEOUS tag, love that it really makes the whole thing pop off that soft and pretty wrapping! LOVE how you strung the banner on the sequin trim, this is AWESOME! Okay, those birdies and banner are definitely cute! What a darling package this makes.